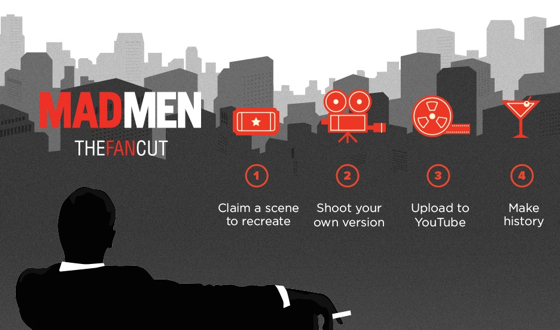 The deadline to sign up for Mad Men: The Fan Cut has been extended to March 16th. Don’t miss your chance to be a part of television history. Participating is simple: First, choose your scene. You’ll have 30 days to film your own version. Then, upload it to YouTube to submit. Up to five versions can be submitted for each scene, and yours could be chosen as part of the final Fan Cut this spring. An exclusive tip just for the blog: If you want to maximize your chances to be featured in the final cut, choose a scene that doesn’t have a lot of other claims. The fewer the claims, the less competition you’ll have!